IMAGES SAY SO LITTLE ABOUT LIFE AS WE REALLY LIVE IT. 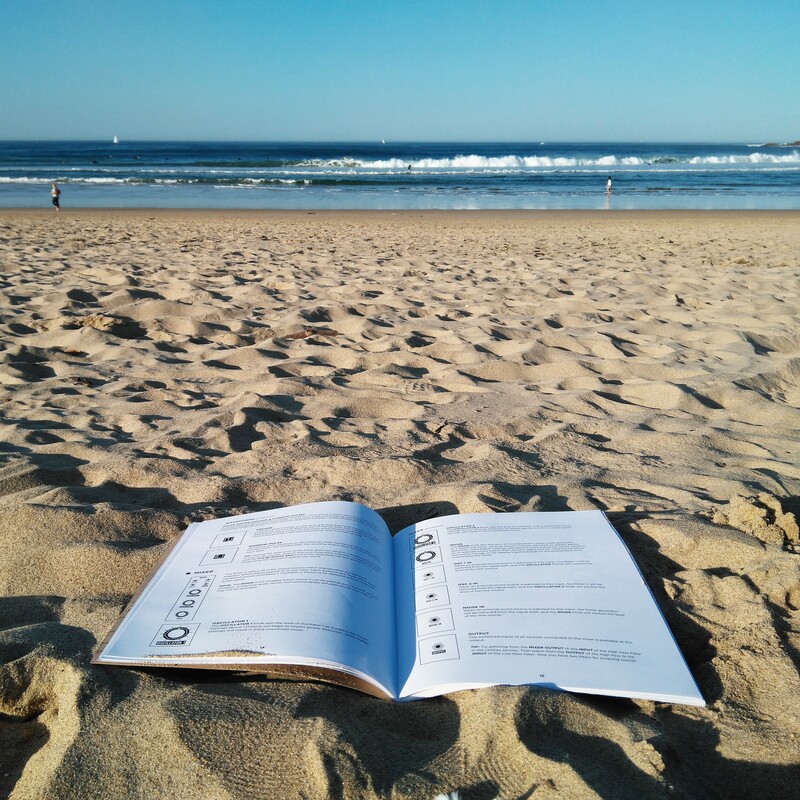 This image depicts my afternoon as it really happened: I really went to the beach, really studied Moogmusic’s Grandmother’s manual, the sun really shone that way, and it really did look this lovely. I felt like taking a picture and sharing it with you, because I’ve shared so very little this year, and yet I realized I could not post this idyllic image without at least mentioning the unpictured counterpart to it: progress on making new music has been agonizingly slow this year due to circumstances beyond my control, and about which I will probably tell you more at some point, but which I feel unsure about sharing publicly now. Amidst the frustration I am feeling regarding my current inability to work on my music as much as I would want to, all I can do is try and make the best of my circumstances, and reading through a manual for the first time in such a beautiful place today was probably the best thing I could do. Like a good few people these days, I have grown uncertain about what consists in legitimately communicating with my audience and what feels and looks like some kind of semi-permanent promotion and display of the self (even the self as musician) complete with personal information which should probably remain just that: personal. However my life as a musician is of course impacted by my life as a flesh-and-blood person, hence a blur which I find not easy to navigate… You can be sure though that the first way in which I will always want to communicate with you is through music, and I have at least cause for celebration in the fact that I have so many ideas and ambitions for my seventh album. As always thanks for reading, and for listening to the music. « THE STORY OF A SNAIL: IMPORTANT ANNOUNCEMENT ABOUT MY FIRST THREE ALBUMS AND EP. You are currently reading IMAGES SAY SO LITTLE ABOUT LIFE AS WE REALLY LIVE IT. at colleen.